Thanks to one of my readers, Jim, I now know that the jellyfish I most often see is the Comb Jellyfish. It is so clear that it is nearly invisible, but if you find one and watch it carefully, you will see colored lights blinking up and down its body. Way cool! Even cooler is what I found out about them (now that I know what they are). According to the April 10, 2008 issue of Nature, Comb Jellyfish were the first animals to exist on Earth. Click HERE to read the story. Also, the flashing lights are caused by light reflecting off of rows of Cilia (hair-like conveyor belts used for propulsion and feeding). Oh, and they are not really Jellyfish because they cannot sting (whew! that's a relief). OK, on to the next mystery. 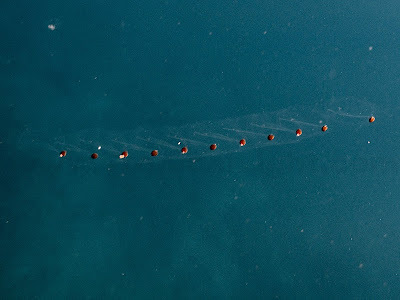 I assume that these strings of red beads I saw today are either eggs or larvae - but of what?? OK, the Comb Jellyfish was easy...this one is more esoteric. My guess is that its a pelagic tunicate called a *salp*. They form long chains of individuals fastened together at the sides of their tunics. Man, you're getting to see some good stuff out there. Enjoy the oceania photos..thx for sharing. Check out James P. Hoover's Books on Hawaiian Fishes and another on Hawaii's Sea Creatures. See if this is it. Wow, Jim, how do you do it? 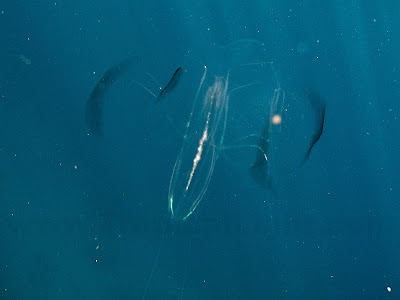 Yes, that must be a Salp - mature animals and not larvae or eggs. Thanks. BTW for those looking for the books, the author is John P Hoover.